When it comes to anti-ageing treatments, Elite Serum™ is the relatively new kid on the block, in the UK at least! Already established in the States, due to it's effective use of Argireline, Elite Serum™ is set to grow in popularity across Europe. 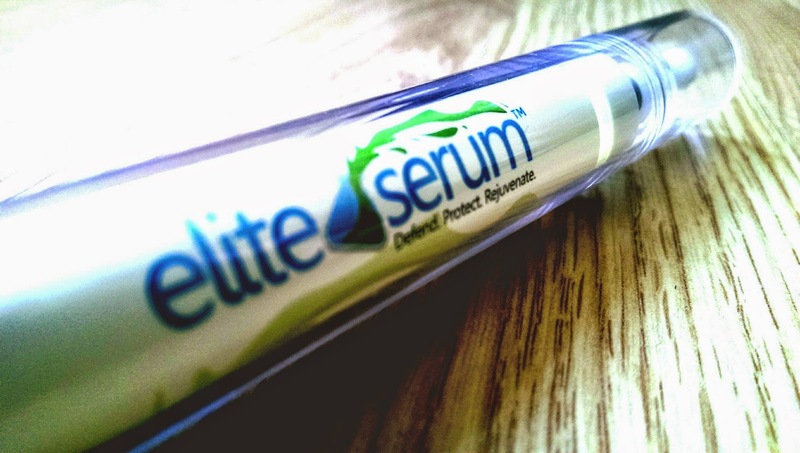 Upon appearance alone, with the clever packaging and branding, Elite Serum™ isn't a skin care product that you see everyday - it certainly is an intriguing product, if nothing else. Before you think it, no, Elite Serum™ is not a needle - it is in fact a cream that comes packaged in a pump that you apply onto the skin around your eyes. Elite Serum™ is designed and formulated to reduce wrinkles and crows-feet. This technological breakthrough combines Argireline with carefully selected patented DNA precursor pool peptidespeptides developed by the science inspired cosmeceutical company SkinPro. Elite Serum™ contains an unprecedented and extremely effective, highly concentrated blend of potent pharmaceutical grade patented peptides and nature's most gifted moisturizers. Argireline® is the brand name for Acetyl Hexapeptide-3. It is considered by experts to be the best needle-free alternative to botox. Argireline® has been shown to reduce wrinkle depth, specially around the forehead and eyes. This was proven in a study published in the International Journal of Cosmetic Science in 2002. In this report, it was demonstrated that a cream containing 10% Acetyl Hexapeptide-3 used by healthy women volunteers reduced wrinkle depth up to 30 percent after 30 days of treatment. In another study by Center Chem®, an open label-trial of 5% Acetyl Hexapeptide-3 cream applied twice daily on 10 women demonstrated a 27% improvement in periorbital rhytids after 30 days as measured by silicone replica analysis. Theoretically, this peptide may mimic the effects of botulinum toxin injections. 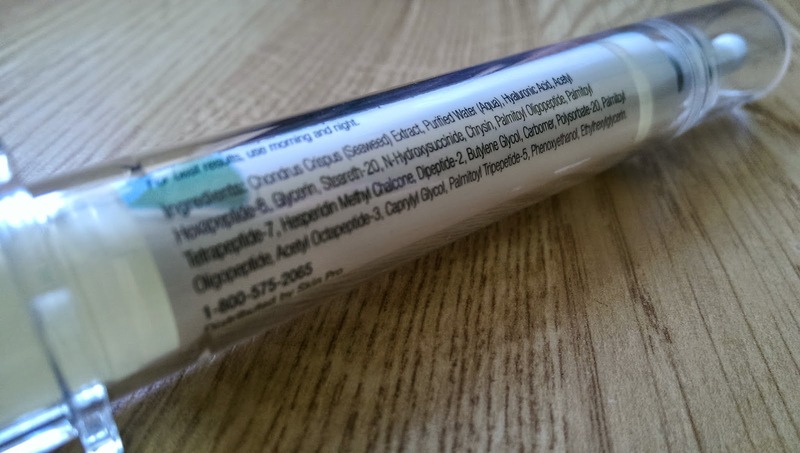 The anti wrinkle octapeptide SNAP-8 is an elongation of the hexapeptide Argireline®. It is well known that the molecular mechanism involved in face ageing is directly related to changes in the conformation of the collagen triple helix, degradation of the elastin polypeptides and certain disorder in the packing of the lipidic matrix of the skin. It has been clearly established that these conformational changes and the disturbance of the perfect packing of the lipid matrix can be significantly avoided by modulating muscle contraction. Muscles are contracted when they receive neurotransmitter released from inside a vesicle. The SNARE (SNAp REceptor) complex is essential for this neurotransmitter release at the synapsis. It is a ternary complex formed by the proteins VAMP, Syntaxin and SNAP-25 (SyNaptosomal Associated Protein). This complex is like a cellular hook which captures vesicles and fuses them with the membrane for the release of neurotransmitter. SNAP-8 is a mimic of the N-terminal end of SNAP-25 which competes with SNAP-25 for a position in the SNARE complex, thereby modulating its formation. If the SNAREcomplex is slightly destabilized, the vesicle can not release neurotransmitters efficiently and therefore muscle contraction is attenuated, preventing the formation of lines and wrinkles. Haloxyl®, also known as Palmitoyl Tetrapeptide-7, reduces puffiness and dark circles under the eyes. This peptide works by encouragi ng proper circulation in that area. Essentially, studies have proven that Haloxyl® reverses the fluid build up that naturally occurs when you sleep. Eyelid swelling is a common cause of puffiness and dark circles. Accordingly, when you lie down, gravity causes fluid to accumulate in your lower eyelids. Haloxyl® counteracts this effect by increasing the lymphatic drainage by 85% in clinical studies. Furthermore, a recent clinical study by SeDerma® concluded that Haloxyl® reduces dark circles under the eyes by 600%. This is the result of the proprietory way that Haloxyl® breaks down and flushes out of the eye area the toxin-formed pigmented blood that causes these dark circles to form. EyelissTM is a proprietary combination of three active peptide molecules which are designed to rapidly and effectively reduce puffiness and bag volume under the eyes by over 70% upon application. This bio-molecular engineered solution was discovered as a result of sensory perception screening tests which were specifically designed to treat puffiness under the eyes. Matrixyl™3000 contains two matrikines™, Pal-GHK and Pal-GQPR which act in synergy to restore and maintain skin's youthful appearance. Matrikines are messengers of cutaneous restructuration and repair. They activate the neosynthesis of extracellular matrix macromecules, thus providing Matrixyl™3000 with a visible anti-wrinkle efficacy. As messenger molecules, these matrikines™ are capable of regulating cell activities. More specifically, they interact with specific receptors to trigger the stimulation of certain genes involved in the process of extracellular matrix renewal and cell proliferation. With age these complex mechanisms become progressively weaker. As such, the supplemental use of an advanced restoration multi-peptide like Matrixyl™3000 becomes an essential part of the formula for maintaining smooth skin around the eyes. Accordingly, in extensive clinical testing undertaken by SeDerma, the application of a serum containing Matrixyl™3000 has been proven to reduce unwanted expression wrinkles by 45% in only 2 months, along major and significant improvements in elasticity and tone. SYN®-Coll stimulates the collagen synthesis in human fibroblasts. Skin ageing and in particular, chronic UV exposure, leads to degenerative changes in skin. This is characterized by distinct alterations in the composition of the dermal extra cellular matrix (ECM). The consequences are manifold such as increased skin fragility, leathery skin appearance and formation of wrinkles. Collagen represents the main component of the ECM of the dermal connective tissue. Thrombospondin I (TSP) is a multifunctional protein that activates the latent but biologically inactive form of TGF (Tissue Growth Factor). TGF is known as the key element in the synthesis of collagen and binds to a particular sequence in the TSP molecule. This sequence is known as ARG-PHE-LYS. As a molecule able to activeate TGF, SYN®-COLL is considered to be an ideal aqueous based peptide. It contains a unique sequence designed to mimic the human body's own mechanism to product collagen via TGF. Accordingly, SYN®-COLL actively compensates for any collagen deficit, thus making the skin look younger. A concentrated dose of ultra-moisturizing Hyaluronic Acid and Seaweed Extract helps to increase skin suppleness and fill delicate fine lines. At the same time, the pharmaceutical-grade Argireline®, Hyloxyl®, EyelissTM, MatrixylTM3000, SYN®-COLL and SNAP-8 have been proven to work directly at the DNA level to revitalize collagen and fibronectin in the skin, previously lost due to ageing. It is this natural loss of collagen that causes the thinning skin and wrinkling that is normally associated with ageing skin. Newly designed and based upon the latest advanced dermatological discoveries, Elite SerumTM can counteract this natural part of the ageing process by attempting to REVERSE THE SIGNS OF AGEING through the new science of DNA rejuvenation. Feel the difference under and around the eye within minutes. Formulated with the highest concentration of pharmaceutical grade ingredients. Delivers a vibrant appearance around the eyes. Work as a single solution for all problems as expected from a powerful eye serum. 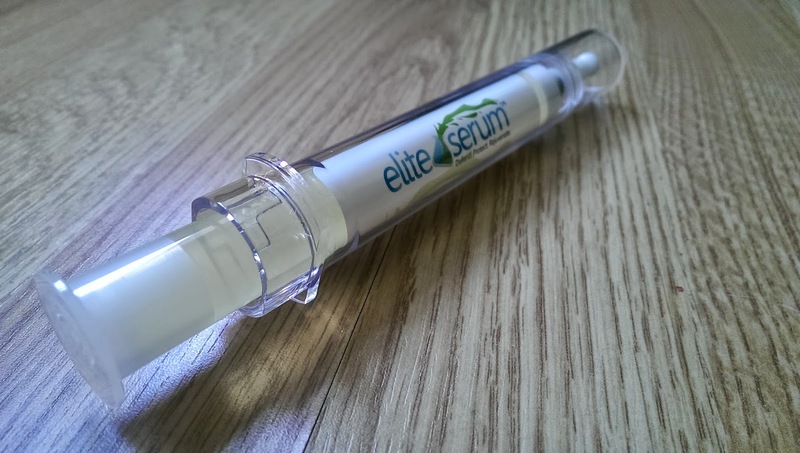 I've only been using Elite Serum™ for a couple of days, so I cannot possibly review the product just yet, as it is recommended to use this cream twice daily over a 3-6 month period in order to get the best possible results. I can however comment on the scent and texture of the formula. The cream is thin, slightly sticky, with a subtle scent - nothing overpowering. The cream absorbs well into the eye area of the skin after a few gentle circular rubs.